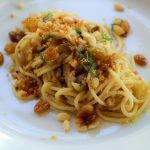 If there is one recipe that sums up all of Sicily for me, it has to be pasta with wild fennel and sardines. 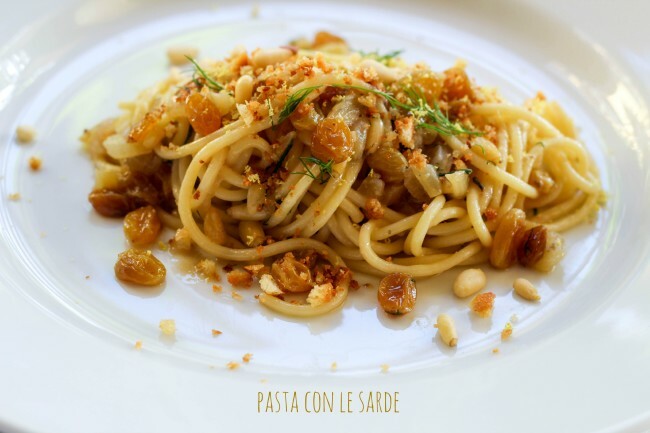 Pasta con le sarde (pasta with sardines) is a dish so subtle, mysterious and harmonious. The soft texture and salty flavor of the Mediterranean sardines against the slightly bitter and musty taste of wild green fennel from the Sicilian mountains. There is also the addition of sweet dried grapes , pine nuts from the forests, a little saffron (a touch of Moorish Spain), all combined with fine Sicilian olive oil. All of Sicily is present in this dish, which dates back to the time of the Arabs. This is a pasta dish that connects me to my history, to my Sicilian heritage. This is one of many Sicilian dishes that connects me to my family and who I am. The food that we have come to know as Italian in the States has its roots in Sicilian soil. These flavors originated in the vast fields of durum wheat the Sicily used to produce Italy’s first dried pasta. The flavors can be found in the juicy and sweet red tomatoes of the coastline south of Syracuse, and in the olives and olive oil from the sun-baked hills found around the island. Brought to America from Southern Italy where it is all now but forgotten, the Feast of the Seven Fishes is a meal eaten by Italian-Americans that features (at least) seven fish/seafood dishes. 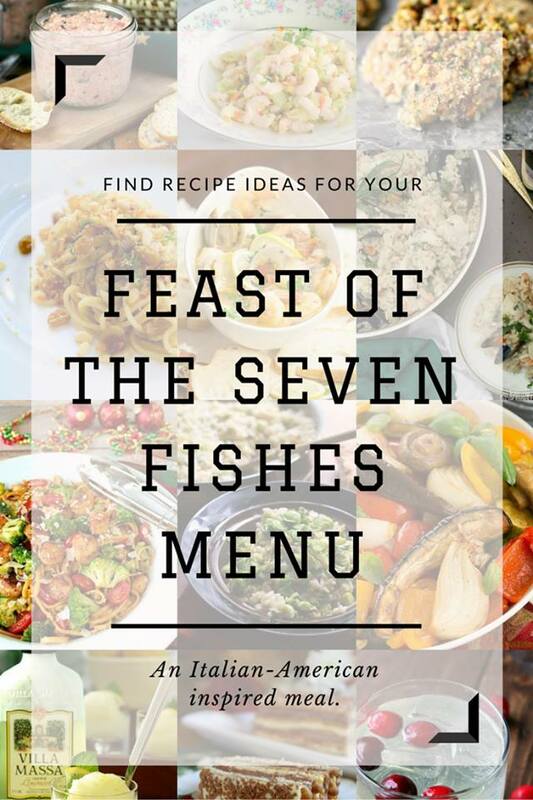 Along with our hosts, myself, and Heather from All Roads Lead to the Kitchen, some bloggers have gotten together to share menu ideas for your Seven Fishes feast. Along with the traditional seven fish and seafood dishes, we’ve included some side dishes, a palate cleanser, a dessert, and a cocktail. The Feast of the Seven Fishes originates most likely in Sicily or even Naples. In my family in Sicily and my in-laws that are Calabrian (but live most of the year in the Lombardy region), they don’t make 7 actual courses of fish. My one aunt in Sicily will have an antipasto (maybe calamari fritti)and a pasta dish with seafood. My Calabrian mother-in-law on Christmas Eve will usually make an appetizer with salmon, a seafood pasta, and she is known to also serve her famous salumi that she makes (even though most do not eat meat on Christmas Eve). So it seems the tradition of seven fish dishes carried over with the immigrants and became more of an Italian-American feast. Why exactly the number of 7 fish dishes? The Catholics fast on Christmas Eve and don’t eat meat. They break the fast on this special cena della vigilia (Christmas Eve dinner) with fish. There are several theories when it comes to the symbolism of seven: it took seven days for God to create the earth, the Bible says. The number seven also could be representative of the sacraments. There are also those families where the number three holds more significance than seven, perhaps as it represents the Three Wise Men and the Holy Trinity. Some Italian families do go all out and make 13 different fish dishes. Twelve of those dishes are representative of the apostles and the last one is for Jesus. What can you be prepared to find on this delicious feast? In my family, we have baccalà, squid, scungilli ‘, calamari (usually fried), clams, mussels, a white fish. There are so many dishes and variations, but my mom and dad used to make an appetizer of stuffed clams, also some fried calamari and a mountain of pasta with mixed seafood. One of my best memories of my parents collaborating in the kitchen was for this festive and delectable evening. Some notes on this recipe: Pasta con le sarde is typically made with olive oil, onions, pasta and a mixture of sardines and anchovy. 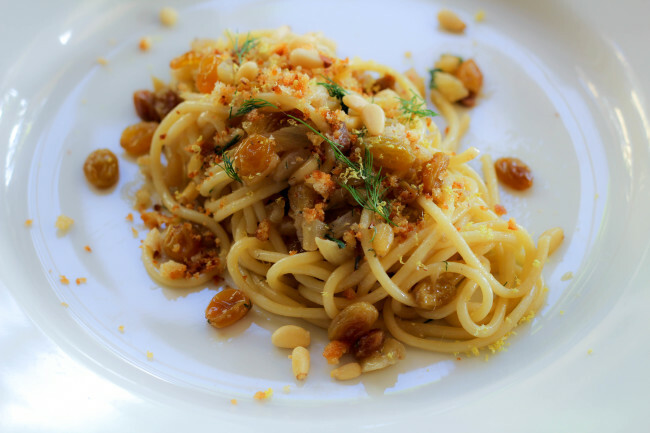 I used spaghetti in this recipe, but you could also use bucatini. Fresh pasta would be ideal, as the sauce just sticks better to the pasta. 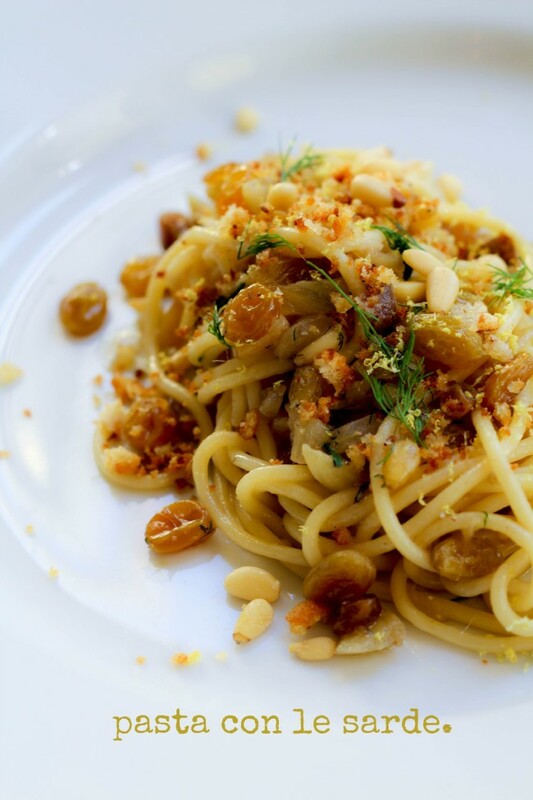 You flavor the dish up with wild fennel, pine nuts and raisins. It is very nice to add a touch of saffron (optional if you don’t have it available). I like to add a splash of white wine and lemon zest to the sauce. And I top it off with the nice crunch of my own bread crumbs (it is so easy to grind and toast your own bread crumbs and adds a much better texture than canned bread crumbs, but use store bought bread crumbs if you don’t have your own).With tomatoes or without? I learned that cookbook author Pino Correnti argues that the tomato-less recipe published in 1886 by the folklorist Giuseppe Pitrè is the only authentic version. In my Sicilian family, it has always been made without tomatoes. Now if we were lucky enough to be in Sicily, it would be no problem to find wild fennel as it grows all over the island. If you can’t get a hold of wild fennel, use the tops of the fennel bulb and the fennel. Here is how I made my homemade breadcrumbs. Preheat the oven to 300°F. Grind the bread up in a food processor. 3-4 slices of bread should yield about 2 cups of bread crumbs. In a large bowl, toss the breadcrumbs with olive oil. Place the breadcrumbs on a baking sheet and toast for about 10 minutes until golden brown (rotate halfway through). Allow the breadcrumbs to cool. Place the breadcrumbs in the food processor and pulse a few times until the breadcrumbs are finely processed. Store in an airtight container. I keep this batch of breadcrumbs in a plastic container in the fridge and use it up in about a month. A big GRAZIE to Heather for asking me to co-host this event and for the wonderful bloggers that joined in! Pasta con le Sarde is as most likely the most Sicilian dish ever created. Wonderful during the holidays or any night of the week. Bring a large pot of salted water to a boil. Drop in the baby fennel and fronds and cook until tender, about 8 to 10 minutes. Drain and chop; set aside. If you can’t find baby fennel, use chopped fennel and cook with the onion. Heat a large skillet with 1/4 cup olive oil. Add the onions and saute until soft but not browned, about 5 minutes. Add the white wine and the anchovies and break up with a wooden spoon. Meanwhile, drop the pasta into a pot of salted water and cook until just al dente. Drain and set aside. Add the reserved fennel, raisins, pine nuts, and a ladle of pasta cooking water to the skillet. Add the sardines and continue to cook, uncovered, until the sardines are cooked through. Add the reserved pasta and a good drizzle of extra virgin olive oil. Stir to combine. Season with salt and pepper. Garnish with the breadcrumbs and lemon zest.